A unique vintage wine was used for this wine vinegar. Feel seduced by the charm of the white grapes! It is perfect for gorgonzola cheeses. 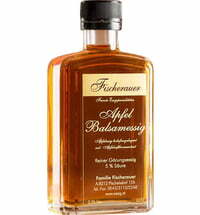 This vinegar is often used instead of balsamic vinegar to preserve the natural color of food. Zotter Schokoladen Mitzi Blue "Thank you"